The chaser is actually a boy at the beach. I find this interesting, but on further thought, not all that surprising. After all, a cute boy surfer would certainly appeal to a girl collecting these. He is wearing a floral bathing suit and a shark tooth necklace. 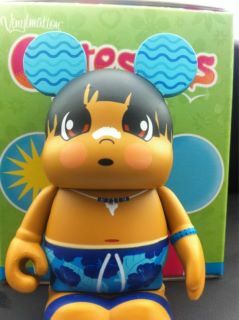 I like how Disney promotes good habits by having all the figures wear sun screen on their noses. The variant, for me at least, is much less impressive. 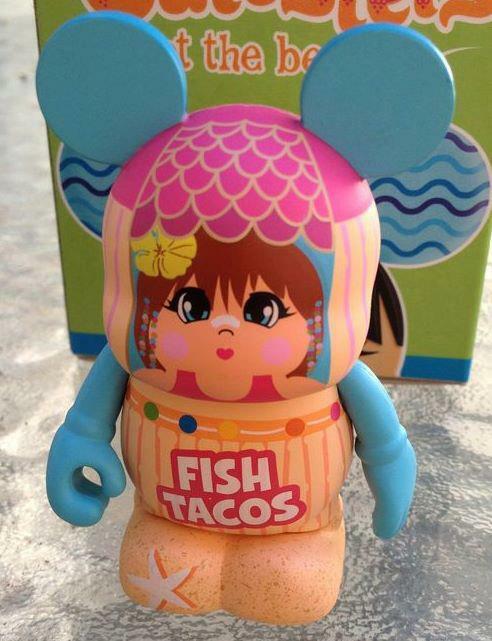 Instead of the Sno Cone stand, it says Fish Tacos. A very Californian (where the Disney Store artists work out of) flair, but Sno Cones is just a much more fun design for me. What are your thoughts on these two designs? Would they be priceless finds for you collection or would you leave them out sea? I’ll admit that I absolutely loved Cutesters 1 but I have been progressively less interested in each subsequent entry into series. I’m really not interested in the series and the chaser and variant does nothing to change that for me. I was interred in both. However thought the series was closed.